What follows is the full-length review based on comments that were originally tweeted in Real-time from the back row of a movie theater @BackRoweReviews. Though efforts were made to tease rather than ruin this movie’s memorable lines and moments, some spoilers may exist in the following evaluation. For concerns over objectionable content, please first refer to one of the many parental movie guide websites. Ratings are based on a four star system. Happy reading! Logan is Hugh Jackman’s ninth X-Men film and his third solo outing as Wolverine. Sadly, after seventeen years of portraying feral mutant, Logan marks Jackman’s final appearance in the franchise. Just as attrition has finally set in for the 48-year-old actor, Logan can no longer heal as quickly as when he was younger and feels the sting of every bullet that impacts on his adamantium exoskeleton more acutely than in his prime. Whereas Logan’s pain is physical, Charles Xavier’s (Patrick Stewart) is mental. In fact, the usually well composed Professor X, Logan’s longtime mentor, is losing his mind to the ravages of dementia. If you’ve ever wondered what would happen if Professor X got really mad and unleashed all of his mental powers into one furious barrage (like Cyclops without his shades), you’ll definitely want to keep an eye out for the movie’s psionic blast sequences…amazing FX. For two characters who started off on rough footing, Charles and Logan have become good friends; you might say they’re almost like a non-related father and son. The scenes where Logan, dutiful son, takes care of Charles, aging parent, are genuinely moving. It’s profoundly sad to see such a brilliant a mind wasting away, but Father Time eventually catches up to everyone, even mutants it would seem. 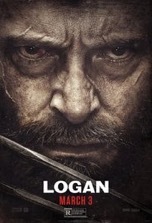 The film’s family connection extends to Laura (Dafne Keen), a young girl who exhibits Logan’s ferocity while fighting and possesses his ability to rapid heal. Logan, directed by James Mangold (Walk the Line), is essentially a pursuit film with Logan attempting to outrun his past so that he can simply fade into obscurity. Although there are plenty of elaborately choreographed action sequences, the story occasionally stops to corral stray horses, which detours the through-line and delays the film’s mission. These scenes are a double-edged sword since they slow down the action in order to provide meaningful character moments, which effectively ground the story and prevent its more spectacular elements from running away with the show. Still, without episodes like the dinner at the farmer’s house, the film would have far less heart. Once the “special” bullet (similar in concept to a silver bullet for a werewolf) is introduced we have a pretty good idea of how it will be used—and, indeed, the ending is painfully obvious. Even though Wolverine’s demise is precipitated by a pulse-pounding fight sequence, he still deserved a more spectacular, more heroic sendoff. However, the scene where Logan passes the torch to the next generation of mutant heroes is heartwarming. So where does the franchise go from here? Will Marvel bestow Wolvie’s claws, laconic speech and rugged mien on a younger actor? Will Laura lead a whole new team of mutants? One thing’s for sure, the X-Men franchise will never be the same. But we can take solace in knowing that Logan/Jackman went out on top in, arguably, the first mature superhero movie ever made.